Our trained puppies are offered at 11 weeks of age. Please be advised that training is subject to availability. Only a limited number of puppies are held back for training. Puppies from any litter may be reserved for training. All training requests must be made via phone or email. Trained puppies also go home with their very own crate, crate pad, blankets and toys in order to help make this transition as seamless as possible. Please fill-out our online application to begin the process of adopting a trained puppy. We will happily answer any questions you may have about the training. 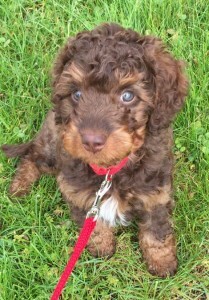 Clients pay an additional $1250 to the contract price for a trained puppy. Please be advised that all training costs are non-refundable once puppy has transferred to our training program. 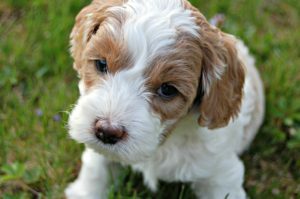 Trained puppies that need to stay after their home-going day may board for a maximum of 7 days at a cost of $35 a day for continued training and boarding. Availability for this extended stay is limited and not a guaranteed option. Contact us if you need to make this arrangement. We are pleased to offer the option of Delivery for Trained Puppies! 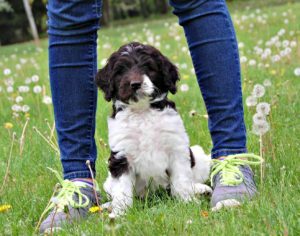 Your trainer will deliver your puppy to your home and provide a one-hour, in-home Training Session with you and your family. This session will cover the basics of commands your puppy has mastered, daily schedule, and important tips to help keep your puppy moving forward in the training they have received during their 3-week, Stay-and-train time with us. The starting price of $300 includes puppy delivery to a service area within a 30 mile radius of our location. For those outside this radius, consideration will be made at an additional cost of $1 per mile for the round-trip total mileage.